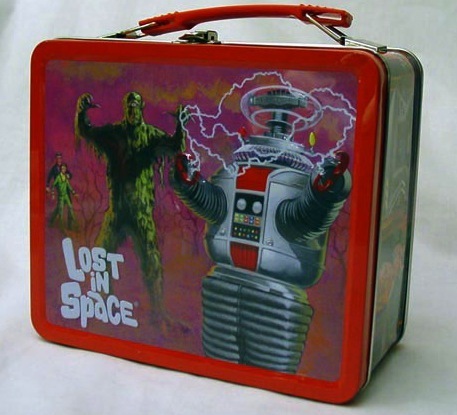 Brand New Embossed Metal Lost In Space Lunchbox! Blasted into outer space on a colonization mission, the Robinson family and their pilot Major West fall afoul of the evil Dr. Smith and wind up hopelessly Lost in Space! Irwin Allen's classic sci-fi adventure series ran from 1965 to 1968 on CBS TV and has become an icon of retro space fantasy. Tin10 collectibles' fully embossed metal lunchbox features the Robot, Dr. Smith, the Jupiter 2 and the Robinsons in brand new retro-style art created by illustrator Chris White. Warning! Warning! This lunchbox is limited to 5000 pieces worldwide!